With over two million apps available in the leading app stores, it is very difficult to get your app discovered. If you want to succeed in the mobile app space, building a great app is no longer enough. You need to make sure that the right people can discover, use, and engage with your app easily. But, how do people discover new apps? 51% of people turn to those they trust such as their friends and family. However, 48% of people discover new apps by browsing in the app stores and 34% of them check out the apps recommended to them in the app stores. It is crucial for mobile app developers and publishers to make their apps stand out in the leading app stores. Higher app store rankings can help you increase the visibility of your app and result in higher app store traffic and more downloads. To help you get your app to the top of the app stores and improve its discoverability and conversions, I’ve created this guide to app store optimization (ASO). App store optimization or ASO is the process of optimizing your mobile app for higher rankings and discoverability in the app stores. It is very similar to search engine optimization, which helps you increase the visibility of your website in search results. With hundreds of thousands of apps competing to grab the attention of the same audience, an effective ASO strategy can help you fuel your app’s success. However, there are a number of app store ranking factors that determine whether your app will make it to the top of the app stores. You need to capitalize on all of them to get people to find, use, and engage with your app. What does your app store rankings depend on? Like search engines, app stores also use intelligent algorithms to rank each app. Let’s take a look at the following five app store ranking factors that can influence the position of your app in search results. And I’ll show you how to optimize your app for improved app store visibility. The way you name your app plays a crucial role in your app store rankings. In fact, it is one of the strongest app store ranking factors in both app stores (the Google Play Store and the Apple App Store). The name or title of your app should include the most powerful keywords alongside your brand name. You should keep your brand name short and concise. And the keywords you include should describe the core purpose of your app and the value it provides. For example, check out the app below. The brand name, “GetFit,” is short and concise. And the keyword, “Home Workout & Fitness,” describes the purpose of the app. However, keyword stuffing or the inclusion of irrelevant keywords is a bad idea. Though this technique might help you get more impressions, it will adversely affect your conversion rate. That’s why you should maintain a balance between brand name and relevant keywords in the name, title, and URL of your app. App stores allow you to mention your target keywords in the keyword field. You need to choose your keywords wisely. They should represent the features and benefits of your mobile app. Also, don’t repeat any keywords that you have already used in the app name or title. User ratings and reviews are crucial app store ranking factors that can either make or break the success of your app. They not only impact your app store search rankings but also impact the conversion rate of your app. If you want to get positive reviews and ratings from users, you need to build a good reputation for your app. Test your app for bugs thoroughly before you launch it. This will help you to deliver a good user experience. You should also encourage users to rate and review your app in the app stores. You can ask users for feedback when they complete a certain level or make a purchase. Make sure that you always respond to their feedback, especially if it’s negative. It can help you turn negative feedback into a positive experience for the user. Negative reviews are also an opportunity to identify and solve bugs to improve the user experience. Positive ratings and reviews act a social proof for the credibility and value of your app. Optimizing your app for this app store ranking factor can help you increase the number of downloads and installations. Along with the textual elements of your app page, you should also optimize the visual assets for better conversions. The icon, screenshots, and feature graphic of your app are one of the important app store ranking factors that you should optimize. A visually appealing app icon can help you attract more users. However, don’t overload it with too many colors or details. Keep it simple yet unique and creative. The leading app stores allow you to add screenshots of the interface of your app on different devices. You should use those screenshots to showcase the top features of your app. That can help you increase the number of downloads. The first 2–3 screenshots are the most important ones. Make them count with engaging text and calls-to-action. In addition to the screenshots, you can also add a feature graphic to your app page in the Google Play Store. It could be an image or a video. You need to leverage this element as a powerful tool to persuade users to download your app. When creating these visual elements, pay special attention to the size of your app. The majority of users prefer apps that don’t consume a lot of space. The more downloads your app has, the higher the demand and value of your app. You need to increase the volume of downloads to boost the popularity of your app in the leading app stores. Though you have no direct control over the number of downloads your app receives, you can use effective marketing strategies to create buzz about your app. You need to track user activity to see how people use your app and where and when they quit. This can help you optimize your app to provide a better user experience. I also recommend that you conduct competitor analysis to find out which keywords are working well for similar apps. You can use those keywords to optimize your app for the key app store ranking factors. 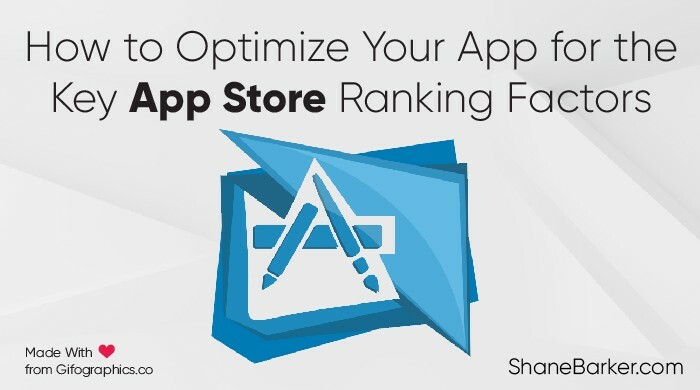 Optimizing your app for these app store ranking factors can greatly influence the rankings of your app in the app stores. It can help you improve the visibility of your app, drive more traffic, and increase conversions. However, these parameters evolve constantly, just like the trends in the mobile app space. You need to consistently track, analyze, and optimize your app for improved app store rankings. If you think any other factor deserves a mention in this list of the most important app store ranking factors, please let us know in the comments below. Also, if you need help to craft an effective ASO strategy to market your app, please feel free to contact me to discuss. How to Optimize Your App for the key App Store Ranking Factors was originally published in Marketing And Growth Hacking on Medium, where people are continuing the conversation by highlighting and responding to this story.